Lately, I’ve been zig-zagging all over the place. One such zig-zag took me to the 1-year anniversary celebration of Bringing Science Home, a joint effort between USF Health and The Patterson Foundation that aims to revolutionize what it means to live well with chronic disease and invisible illness. I get to sit through a lot of health and medical presentations, and I get exposed to all sorts of ideas about how to treat patients, and the roles that health professionals play in educating people with chronic illnesses. Sometimes I am moved by what I hear so much that I have to fight the urge to stand up in a chair and applaud; other times I am moved in the opposite direction, and I have to fight the urge to jump up and interrupt the folks who are doing the talking and dole out a bit of education myself. I can really get behind what Bringing Science Home is doing. Finally, there is a group that is getting organized and making efforts to bridge the gaps in areas of life with chronic illness that our current systems too often neglect. Imagine you are a young adult in today’s world. You have just graduated high school, and are off to college to pursue the dreams of higher education. The world is your oyster! You get to set your own class schedule now, pursue your own interests, meet new people, join clubs and organizations, go to parties, stay up all night cramming for that big test you have tomorrow, maybe find a job, meet someone that fancies you and start a relationship. The sky is the limit! If you have diabetes, you also have to make sure that you are doing what you need to do on that front as well, so that you are able to have all of the adventures of a college education. Before, when you were at home, it might have been easier. Your parents may have taken care of making sure you have insulin, diabetes supplies, test strips, and regular visits to your diabetes doctor, eye doctor, dentist, etc. They also probably helped a lot with making sure that you had the proper foods to eat, and that there was always a juice box or something nearby to treat a low blood sugar. Life in college is different: It’s all on you now. Add those two together, and it is A LOT for a young adult to have to deal with. Keeping up with all of the diabetes stuff, plus all of the college stuff, it’s no wonder that most people with diabetes in college find that their control starts to slip. Enter Students With Diabetes, a group of people whose aim is to create a community and connection point for students with diabetes on college campuses. That’s right, “campuses.” Plural. This is not an initiative restricted to just the University of South Florida where Bringing Science Home lives. At publication of this blog post, Students With Diabetes is on 28 college campuses across the nation, and growing! How amazing to be able to meet other people, with diabetes, who are going through this incredible transition and learning experience, and not feel like we have to hide our condition! Typically, we learn to hide and suppress our own needs so that we better fit in, whether we’re in college or just in normal day-to-day life. Being shown through our interactions with others that we don’t HAVE to hide is really what living well with diabetes is all about. 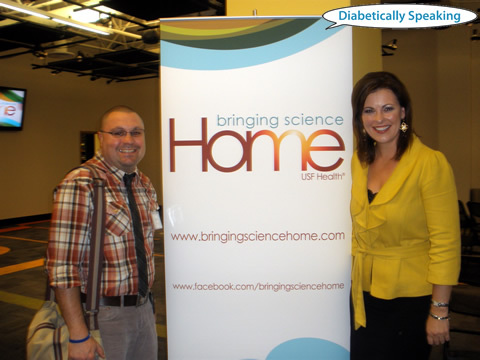 Bringing Science Home is heavily focused on life with diabetes, but it is even more about helping people of all ages and with all chronic illnesses get the help and support that they need to thrive. Whether you are Students With Asthma, Students With Diabetes, or at another life stage or have another chronic illness that doesn’t get the support it deserves, I am so very encourage by what Bringing Science Home is doing, and am confident that efforts like this are the future of living well. what an awesome program. i hope that when my kid goes to college (7 years from now, eek! ), she attends one with a students with diabetes connection.